Will you be clamouring for this clamshell? 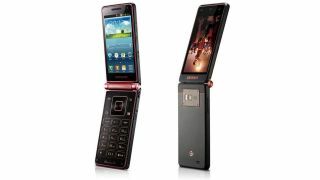 One thing we miss here at TechRadar are flip phones. You know, the ones where you could angrily end a call by snapping your handset closed, or answer it with a quick flick of the wrist - it was pure, unadulterated satisfaction. Sadly the clamshell design has faded into the ether thanks to the uprising of candy bar touchscreen devices, but the folks over at Samsung may be about to revive the flipper in the form of the Galaxy Folder. According to reports the Galaxy Folder will run Android 4.2 Jelly Bean and will feature two 480 x 800 displays, dual-core processor, 8MP camera, 4G connectivity and that famous numerical keypad.